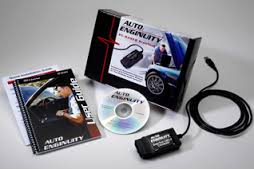 Using the Auto Enginuity diagnostic software is sometimes intimidating to the first time user. Once you understand how the system functions it’s actually very easy. If you follow these instructions step by step you should be able to connect to a vehicle are start your diagnostic process. We are going to assume that you have already downloaded the AE software and installed it on your computer. You will need to make sure you connected the dongle and vehicle connector to your usb ports on your computer as well. If you have enhanced features, you will have to enter the authorization codes provided to unlock those features. You will want to enter the year, make, and model of the vehicle you are connecting to. The diesel pickups have to use their individual engine model in the model drop down where you would put vehicle model gas vehicles. Not all vehicles will require every information box filled out but it is best to select the applicable options for each box that you can select options for. If you have the enhanced version for that vehicle you will see the ‘Enhanced Powertrain Can’ show up when you have selected the right options. If you do not see the enhanced show up you can still connect but none of the enhanced scanning features will work and you can only do very basic level scan tool features. If you notice the drop down menu in the image above, this is also where you can select other ecm modules like anti-lock brake, transmission, instrument control, etc. You will sometimes have to connect directly to these other modules when you want to performance actions like transmission resets and auto brake system bleeding. Once you have the proper selections made on the menu and the module you want, click ok and it should start connecting to the vehicle as the image above shows. If you select the all button, the scanner will retrieve any and all trouble codes from every single module. This isn’t always necessary. Most of the time when you are just diagnosing an engine performance problem you will want to click the middle current button. This will retrieve the current and active DTCs. 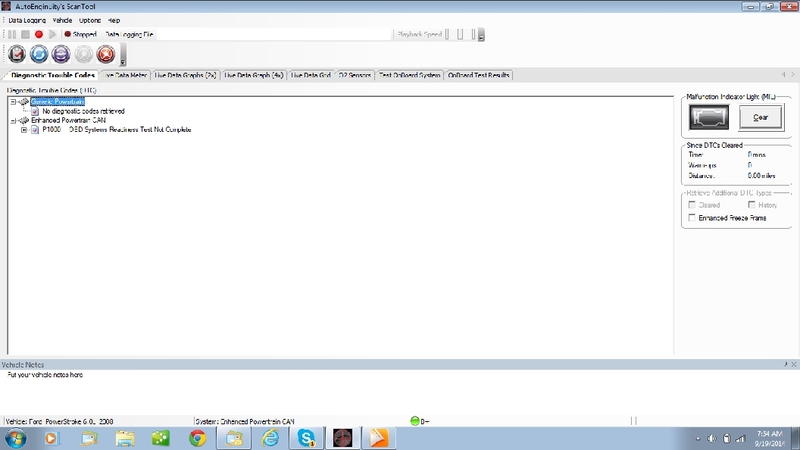 And lastly if you aren’t concerned with the DTC codes at all you can click the none button and skip retrieving them. By clicking the clear button on the right hand side you can clear/erase the codes in the vehicles PCM. This should shut the check engine light off unless there is a current problem that is turning on the code. To recheck the DTC codes after clearing them click the refresh button on the left hand side to bring the retrieving DTCs dialog box back up. Remember that DTCs (diagnostic trouble codes) are not the end all in diagnosing a performance problem. They are only a clue to what the actual problem may be. Once you retrieve the codes it is a good idea to consult a repair manual for the steps to properly diagnose the problem. 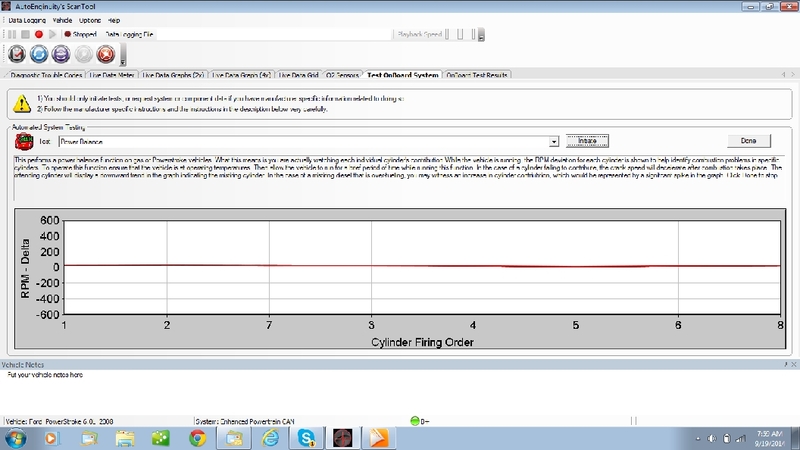 The rest of the features in Auto Enginuity will allow you to perform the tests and view the data streams to you will need to make an accurate diagnoses. Once you have the diagnostic steps you need to follow to diagnose a particular problem, you will find that you will need to view the raw data that the vehicle’s ECM is reading. There are several ways to do this with Auto Enginuity. The first is by clicking on the tab at the top of the screen labeled live data meter. This will bring up several boxes like the image below. From the drop down menu in each box you can select a different sensor to view in real time. The second way to view the vehicle data is by clicking the tab for live data grid. This puts the same data from the last chart into a different style that some may find easier to view. 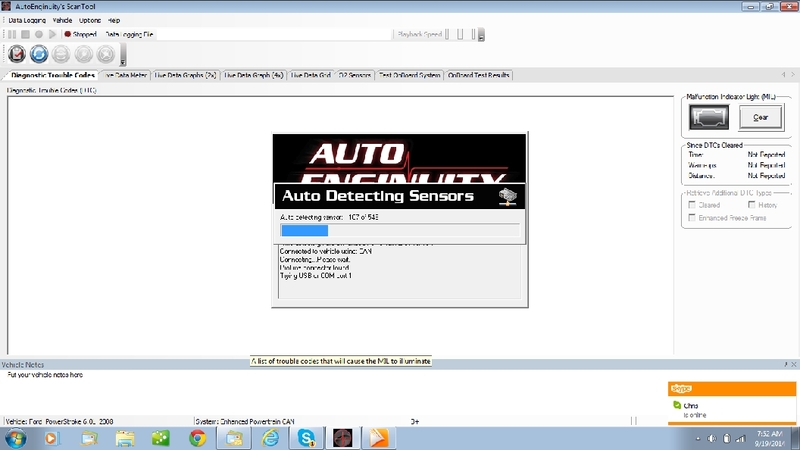 Just select the parameters you want to monitor by checking the box of that sensor from the list below. 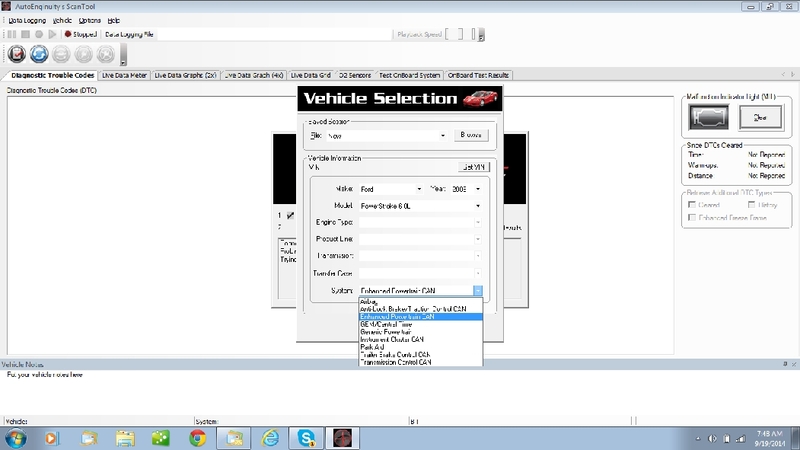 The last way to view vehicle data in Auto Enginuity is by clicking on the live data graph tab. 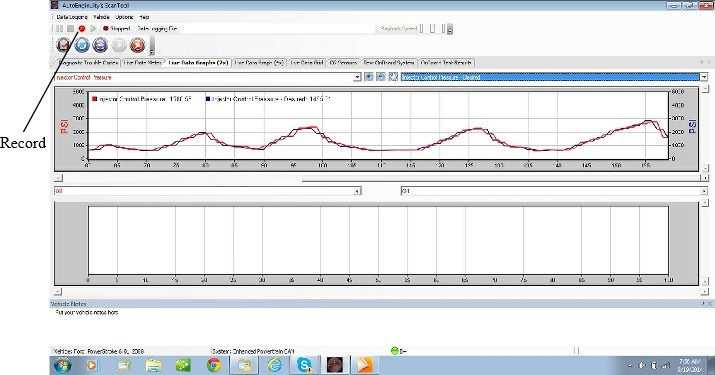 This will let you watch the sensors values on a graph as the image below shows. This is particularly helpful if you are trying to compare a desired value that the ecm is requesting and the actual value that the sensor is returning as in the image below. You can also adjust the scale on either side of the graph to make the values more specific to a certain range of results you are looking for. This tab is also really useful for monitoring sensors when driving since you can look back through the graph if a particular problem occurred only when driving. You can focus on the road and then stop and review the data instead of trying to watch and remember the data like in the grid and meter page. There is also a helpful feature available on all the data screens that allows you to record. Notice the record, stop, play, and pause buttons on the image above. This will allow you to record your data session and then play it back. This is extremely useful when driving and trying to replicate a performance problem. This way you can concentrate on the road and then pull over when you experience the problem. You can play back the readings and fast forward or rewind to find a specific point in the data. The next useful tab is test onboard systems. If you click on the tab the screen below will open. 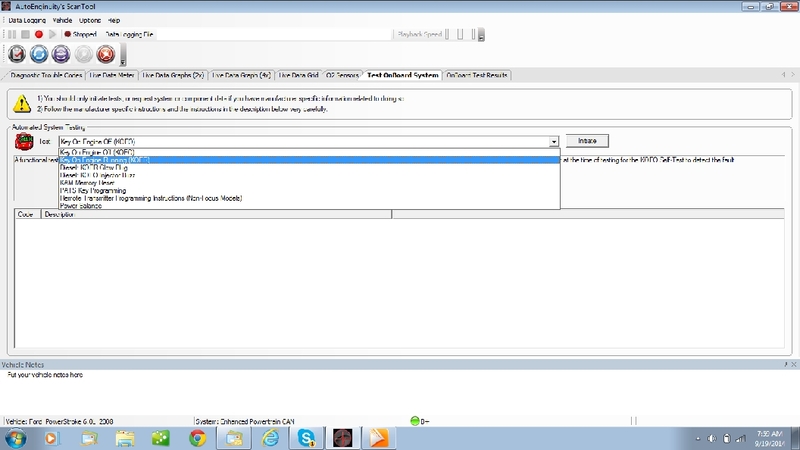 Which will allow you see the specific tests available to run for the vehicle selected. KOEO (Key On Engine Off): This test checks all the sensors and actuators for an in spec reading. 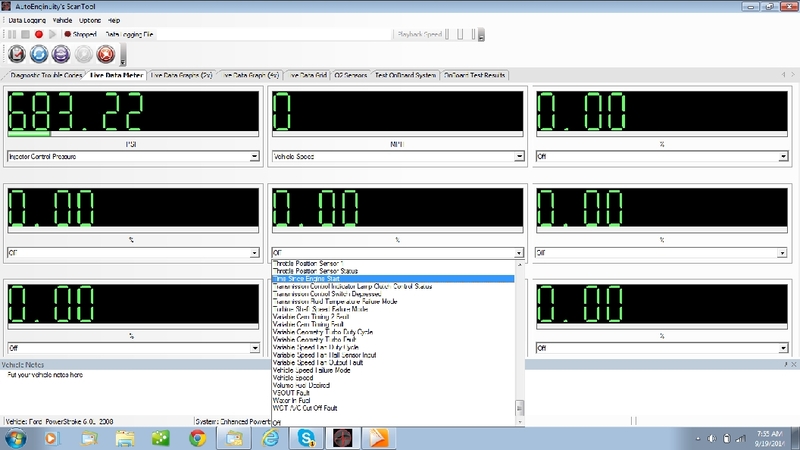 KOER (Key On Engine Running): This test will check all engine parameters while the engine is running. This test will usually rev the engine up and also do a cylinder balance test as well. This test is used fairly often to diagnose performance problems. The rest of the tests are vehicle specific and will be different from vehicle to vehicle. There is usually a couple of security tests, sometimes tire size adjustment, and other random tests. Consult your repair manual on these other tests for instructions on interpreting and performing the tests. One test that is extremely helpful when diagnosing cylinder problems is the cylinder balance test. The vehicle usually needs to be at operating temperature before it will enable, but it should return a graph like the below image. This particular vehicle is running good and has a smooth graph. Any cylinder events will show up as a quick spike or dip over the cylinder that has a problem.